Ready yourself for the greatest race in the world in Great Balloon Adventure slot machine by H5G. It's man vs man, and you vs the house in this 5-reels, 243-ways game. The symbols float up onto the reels in a new presentation, different from the standard falling symbols of typical slots. What's more is the game has great bonus features including Free Spins, Wilds and Tumbling Reels feature. 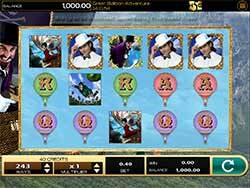 Ready yourself for the greatest race in the world in Great Balloon Adventure slot machine by H5G. It’s man vs man, and you vs the house in this 5-reels, 243-ways game. The symbols float up onto the reels in a new presentation, different from the standard falling symbols of typical slots. What’s more is the game has great bonus features including Free Spins, Wilds and Tumbling Reels feature. Wild Symbol – The Game’s logo is the the wild and substitutes for all symbols in the game except the free spins trophy trigger symbol. You can find wilds on reels 2, 3 and 4 to complete possible wins. Free Spins Bonus – Land three trophy symbols anywhere on reels 2,3 and 4 to start the free games bonus where you start with 10 free spins! Tumbling Reels Feature – All symbols in winning combinations disappear. The empty spaces are filled as symbols tumble from below. Afterwards, symbols are re-evaulated for new winning combinations. Reels continue to tumble until no winning symbol combinations are created as a result of the tumbling reels.